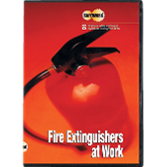 Satisfy OSHA's training mandate by showing our SafeWork® Fire Extinquishers at Work Video! 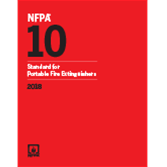 Don't work without the latest edition of NFPA 10. NFPA believes that children should not be trained how to operate portable fire extinguishers. Teaching children to use portable fire extinguishers runs counter to NFPA messaging to get out and stay out if there is a fire. Furthermore, children may not have the maturity to operate a portable fire extinguisher properly or decide whether or not a fire is small enough to be put out by the extinguisher. They may not have the physical ability to handle the extinguisher or dexterity to perform the complex actions required to put out a fire. In the process of extinguishing flames, children may not know how to respond if the fire spreads. NFPA continues to believe that only adults who know how to operate portable fire extinguishers should use them.